Many household utilities are located in the basement – which is why a window well is an important addition to your finished basement. 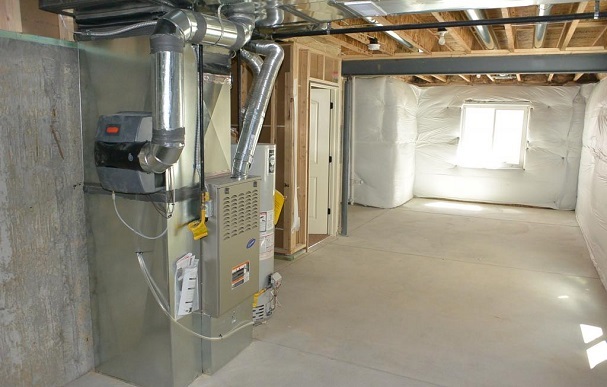 Basements are one of the most functional areas of any home – a great place to locate important utilities like a furnace, hot water heater and electric boxes out of sight, and away from children. But utilities are one of the leading causes of fires – so placing them downstairs, in a basement, increases the risk of a basement fire. If one breaks out – does your basement have a means of egress? A means of egress is simply an escape route – in a basement, most commonly an egress basement window and window well. These are large, fully-functional windows that can be opened wide enough from the inside to allow people to crawl out of them – and let firefighters crawl in. That’s why it’s now part of national building code to have a means of egress installed in your basement. If you’re in the process of installing a basement window, we recommend giving some serious thought to where your household utilities are located first – and consider how that might influence the smartest and safest place to install your means of egress. You want to make sure that a utility fire doesn’t block access to a resident’s means of escape! This involves mapping out where potential fire risks are – like water heaters, and a basement kitchen if there is one – and then plotting out escape routes from every room in the basement. You want to make sure that if a fire breaks out in one particular area, it won’t block access to both the stairs out of the basement and your egress basement window. This will sometimes mean you have to place your basement window well somewhere other than you’d first planned to – like shifting it from a bathroom to a bedroom. But while this might impact some of the aesthetic qualities an egress window adds – like natural sunlight, and a source of fresh air – it’s worth the inconvenience because it could save somebody’s life. And, at the end of the day, that’s the most important thing.